Bark and mulch industries trade in volumes. This is the accepted unit of trade worldwide. 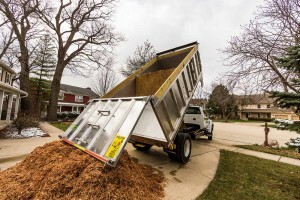 When bark, mulch, topsoil, woodchip, compost, peat and other landscaping products are loaded into a tuck, the volume of the material should be measured before trading. There are few better methods, if any, of determining the volumetric load measurement in bark and mulch industries than the load volume scanner. Traditional truck or loader buckets weighing are not accurate as they fail to consider aspects such as the density of the material and the moisture content. The load volume scanner provides accurate, fast and efficient non-contact volumetric load measurement. It gives direct cubic meters or cubic yards output based on 3D volume scanned images from the system. The load volume scanner accurately reports the actual loose load volume in the truck irrespective of how it was loaded or how wet it is. It is the fairest method of volumetric load measurement. This type of 3D volume scanner system was first installed in a mulch manufacturing company in New Zealand at first before spreading to the rest of the world. Since then, it has improved to offer more accurate measurements. In mulch operations, the load volume scanner acts as a monitoring system to see that the operators are correctly loading trucks and suppliers are not supplying less of what they claim. The system combines low maintenance scanners with reporting software that can be remote controlled to bring accurate volume measurements. Not only does the load volume scanner produce real time accurate load measurements but it also trains the operators. The feedback given by the system significantly improves the accuracy through which the loader operators load the trucks to attain a targeted volume consistently across all loading machines. A bark and mulch manufacturing company that has installed the load volume scanner will always get accurate raw material volumes from the suppliers. When a supplier learns that their supplies are being monitored, they will strive to accurately load the right volume. Besides measuring load volume, the system further captures details such as type of product, the supplier and the customer, order number and weight docket among others. With the load volume scanner system, generating an invoice or reconciling one is easy given that the system offers real time and historical reporting. With this feature, you can generate a report on Microsoft Excel which will enable you analyze the performance of the company. Besides these great features, load volume scanner is a non-contact load volume measurement technology that does not require regular servicing and neither does it require calibration. Load volume scanner systems are more than a form of load measurement technology. It can be used to determine the density of the load. To do this, the system uses the measured volume and the weight data to calculate the density. The load volume scanner is used to measure large scale mixing quantities during the production of a batch. The system helps the operators analyze load self-compaction. Put simply, the load volume scanner system has revolutionized bark and mulch load volume measurements. These are just a few leaders in load volume scanner technology. While most of these systems are all similar in functionality, there are subtle differences in performance, reporting, and other specs that are worth considering.